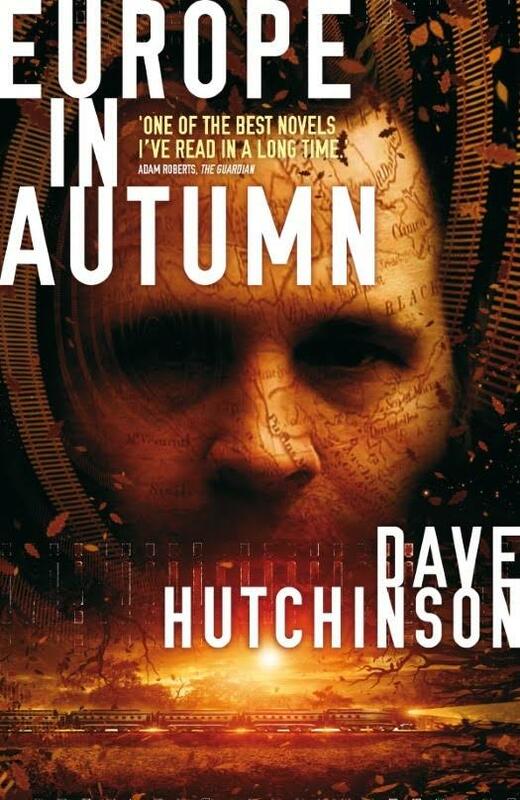 EUROPE IN AUTUMN – Dave Hutchinson (2014) | Weighing a pig doesn't fatten it. I didn’t make a lot of notes while reading Europe In Autumn, the first book of the Fractured Europe sequence. That’s a good sign, in this case. Dave Hutchinson doesn’t try to do anything else than write a good book: there’s no philosophical pretension, no glaringly obvious attempts at social commentary, no need to teach us readers some moral lesson. It’s just 317 pages of solid storytelling – there’s not a single secondary thing that throws this book off balance. No message doesn’t mean this book is without politics. Set in a not so distant future Europe, political disintegration – Brexit, Grexit, Scottish nationalism – has continued, as have cutbacks in the public sector. The Global War On Terrorism rages on. Schengen is dead. What exactly constitutes a nation has become increasingly murky – yet clearer too: money & violence. At first Europe In Autumn doesn’t seem like SF – it’s more of a spy thriller: Alan Furst was one of Hutchinson’s inspirations. A thriller that starts in Kraków, Eastern Europe, and as such has a vibe similar to a lot of Cold War stories. There’s codes, and dead drops, and fake identities, and a cut off head in a locker. We are introduced into this world via a fairly standard plot device: the training of a new spook, Rudi – the main character. As the story progresses, the plot thickens, and the speculative nature of the book increases. It is extremely well done, and Hutchinson catches his readers by surprise. To say more would spoil the fun. Whereas the first part of the novel doubles as a tutorial on spy stuff & the new political map of Europe, the second part ups the ante, and the pacing. Hutchinson doesn’t hold back, and forces the reader to make a few jumps – great stuff, as a lesser author would have added 200 extra pages to explain and explain and explain. Hutchinson’s choices work much better, and leave us wanting for more – much more: Europe At Midnight and Europe In Winter will hopefully quench that thirst. As he says in this interview, Europe At Midnight is more of a companion book than a sequel, telling the same story from a different pov. I guess Europe In Winter – set for publication in November later this year – will be a true sequel. 9/14/2016 newsflash: Hutchinson just announced a fourth and final book on his blog, Europe At Dawn. A few quick notes on technicalities. The prose is good, does the job. Funny at times, a bit hardboiled, deadpan, English. Suits the content well. However, the [landlord] had been unable to predict with any great certainty when a replacement for their recently-deceased washing machine would be forthcoming. Which meant that, at around half past nine that evening, Seth was sitting on a padded bench in the neon-lit tropical heat of the local launderette, watching his underwear doing flickflacks in the drier. The few main characters are rather thin, but this doesn’t hurt the reading experience, as there’s lots of detail and depth in their surroundings, even in the side characters: new story angles are introduced every so often via small vignettes – each twist gets a specific setting with some characters that are well drawn in a couple of pages only. There’s new technology present, and the way that’s handled has a freshness too: it’s just there, taken for granted, without the author being showy about it. Cool tech pops up a few times, but it’s not the focus. Comparisons have been made to works as diverse as Le Carré’s and The Crying of Lot 49 and The City & The City. I’m not saying Europe In Autumn is the hallmark of the New, as its influences are clear and proud – I counted at least 5 self-aware meta references to the crime & espionage genre. So, not completely new, but very much its own thing. Entertaining, snappy & imaginative. Who would have thought a railroad company can be a nation? This entry was posted in Reviews and tagged 2010s, Dave Hutchinson, David Hutchinson, Europe In Autumn, Fractured Europe Sequence, Review, Science Fiction. Bookmark the permalink. You’ve sold me! I’m making a note of this just as soon as I finish this comment — a great review. Thanks, that was my intention, it’s a great book. I think it should appeal to non-SFF fans too btw – unless they hate spy thrillers that is.